When it comes to putting together a great outfit, the clothes aren't the only things you need to get right. Your accessories can easily make your look or drag it down, so it's important to choose the right ones. So, to help you make sure that you look chic, fashionable, and up-to-date from head to toe, we've put together this list of the best accessories of the season. Browse these street style fashion pictures for a close-up look at the purses, shoes, jewelry, and other accessory trends that you'll want to be seen in this year. Paging 2010 era Jennifer Lopez... head scarves are totally a happening thing this spring. We're super glad about this, not only because of the head scarf's hip meets bohemian vibe, but also because they're a great cover-up on those drizzly spring days when the humidity makes our curls frizz out. Here's how to wear a head scarf and still show off your fabulous hair, by wearing it like a hat pushed back on your head. Geometric shaped bags are an emerging spring fashion trend this year. Take a look at this cool blue hexagon cross body purse, worn over a must-have denim jumpsuit and a nubby tweed jacket. Creatures and critters abounded in the jewelry that was worn down the runway at the spring/summer fashion shows. Now, animal motif jewelry is popping up in street style photos and on fashion blogs, as one of the key trends for women's accessories this spring. Here, cheeky dinosaur earrings add a hint of fun to an otherwise serious outfit for work. We're used to seeing animal print purses (think that perfect leopard print clutch that goes with all your outfits). But accessories with pictures of animals used to be reserved for the kiddie set. Not this spring, when designers are encouraging us to wear carryalls and clutches that tell everyone what your favorite animal is. Call your grandmother — pearls are back! Always classic but newly fashionable this spring, pearls are a great way to easily dress up any casual outfit. Here, multiple faux pearl necklaces of varying lengths are layered to create a profusion of pearls that prettifies a simple sporty sweater and jeans look. Want to instantly dress up a casual weekend outfit this spring? Simply add a single, long strand of pearls, to add chic style to even the most basic outfits in sportswear or jeans this season. Optional — loop the strand once to create a shorter strand around your neck, as pictured here. Some designers aren't content to let their accessories speak for themselves this spring. Several design houses emblazoned their name right across their products this season, perhaps with the thought that if you drop a bundle of cash on an accessory, you'll want to make darn sure that everyone knows it. From Givenchy to Dior, this is a trend we've noticed in purses this season. The label love trend has even migrated to footwear this spring fashion season, as seen here. You don't necessarily want people to be able to see right through you, but this spring, designers are encouraging us to let people see what's in your purse. We're not sure we're organized enough to brave this trend, but make no mistake, see-through purses (this one is Chanel) are going to be a huge accessories trend this spring fashion season. Clear plastic rain boots were all over the spring/summer fashion runways and here's a look at this of-the-moment trend from street style. You'll turn heads and look right on trend when you step out this spring in footwear with a juicy fruit theme, like these trendy watermelon high-heeled shoes. Whether you choose flats or high heels, the fruit motif is going to be popular across women's accessory categories this season, from purses to shoes to jewelry. Add whimsy to your spring fashion outfits with a fruit inspired handbag. We're crazy over this cool clutch in an adorable strawberry design, complete with a leaf-like purse accessory. Layering jewelry is a key trend that you'll want to know about this spring. To layer necklaces, start with a favorite piece, whether that's a classic strand of pearls or a long silver pendant, then add more necklaces until you feel like you've hit the right combination. For an eclectic look, as pictured here, vary the types and lengths of jewelry you're layering. Or, you can layer several similar necklaces (say, gold chains) for a more refined vibe. Why wear one shiny bangle, when multiple bracelets will do? We love the trend of piling on all your bracelets on one wrist, as a fabulous way to create visual interest in your spring outfits. Mix your metallics (wear gold, silver, rose gold, and bronze at once) for the most modern look. This is a great fashion trend that will always add style to your outfit, whether you're wearing long sleeves or short, or dressing in patterns or solids. You put so much thought into pulling together the perfect outfit, right down to the shoes — and then you wear it with a plain bag. Ditch the neutral, solid colored totes this spring, in favor of a trendy patterned bag. Whether it's small or large, riotously colorful or smoothly sophisticated like the structured Dior handbag pictured here, this spring accessories trend is a stylish way to amp up all your outfits now. Here, a patterned bag is the most exciting thing about this outfit. Memorize this accessory trick so you can use it to make all your basic outfits instantly street style worthy — simply adding a fabulous bag can easily make your entire look, whether you're wearing a suit, or your weekend baggy jeans. Maybe it's the influence of the Dynasty reboot, or just the general nostalgia for 1980s excess. Either way, big crystal earrings are a definite thing this spring in women's accessories. Check out how the square pair pictured here totally delivers an '80s vibe to this classic outfit in jeans. Chandelier earrings in crystal look like, well, actual chandeliers. Start a conversation this spring with a pair of long, dangling earrings. 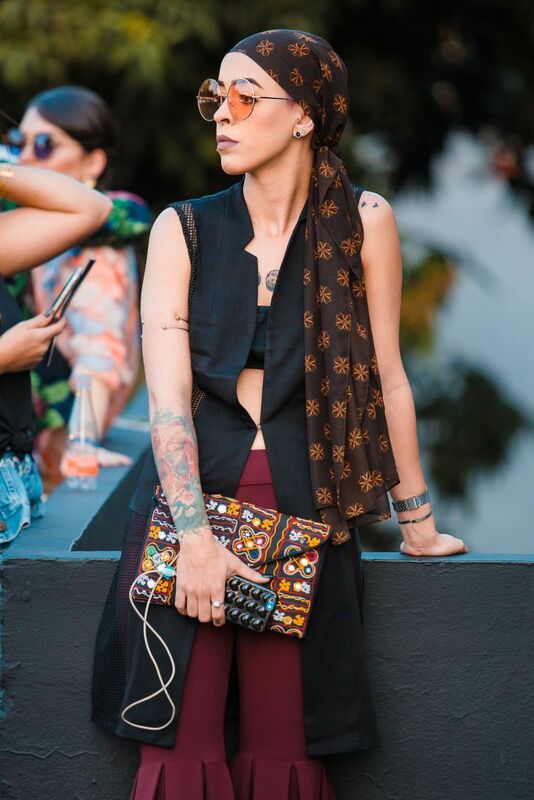 You can also go all-out with a matching bejeweled top, as seen in this street style photo. Trend Test: How Does the Big Bag Hold Up?